Being the end of July with a good weather forecast, Meelmore Lodge Campsite was pretty busy by the time we got there. Its 3 fields were full of stupidly large tents and the smell of barbequeueing sausages hung heavy in the air. We were proper late. The plan had been to set out before 8pm but it was after 9 before we rolled up and even worse, not wanting to tempt the darkness we had sped by McDonards with sad faces pressed against the car windows. It didn’t take long to get our rucksacks on our backs and trot off down the lane by the car campers who were all likely wondering why the hell we would spurn a tent by a car for carrying all our stuff into the mountains. Slieve Meelmore rose high before us as we crossed the wall with the scary sign warning that farmers can legally shoot dogs that they suspect of worrying their livestock. Not having any dogs we disregarded and rambled on gassing about the weeks work and enjoying some late evening sunshine. 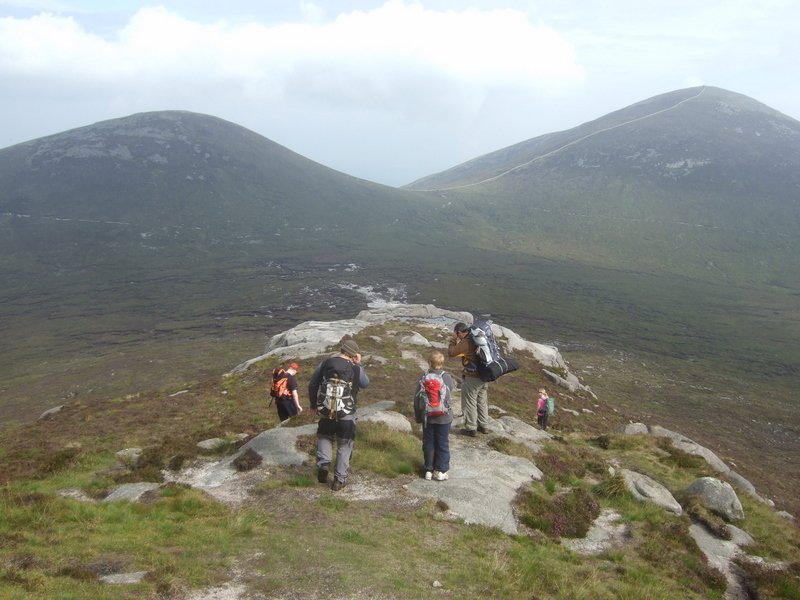 We skirted the base of Meelmore rather than tramping directly to the Trassey Trail as the recent spell of dry weather had left it less boggy underfoot than usual. 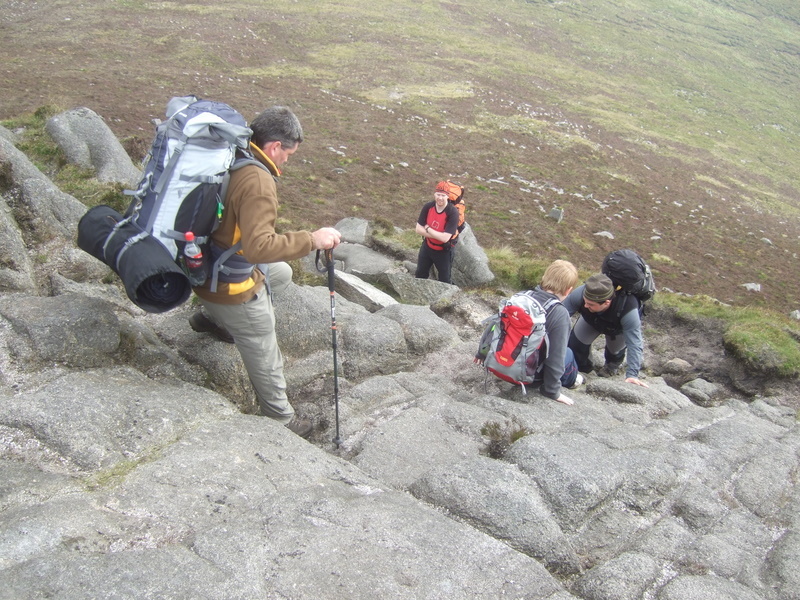 Eventually we crossed then slow flowing Trassey River and met the man made granite trail that leads from the base of Hares Gap past a long abandoned quarry rising sharply by Pollaphuca and the Bearnagh Slabs to the Meelmore / Bearnagh Saddle. 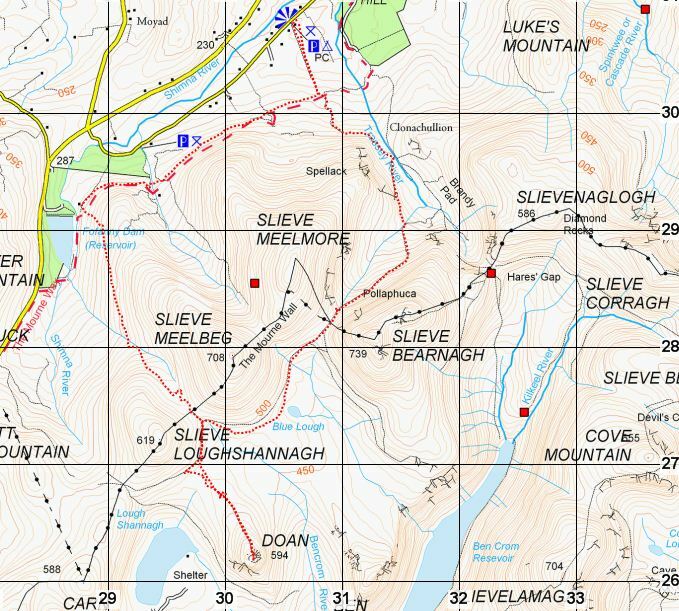 As usual, being pretty unfit I was travelling as light as possible and had only brought a single litre Sigg of water assuming that would get me to top of the tributary between Slieve Meelmore and Slieve Bearnagh that feeds the Trassey River. It was here that we had refilled on a previous trip but alas, that had been April and this was the end of July and what had been a decent flowing river was now reduced to a sorry trickle. I own a Travel Tap, an ultralight water purification system which is advertised as 99% effective but as you might expect, it was at home in the cupboard. We crossed back and forth hearing the river but unable to locate any decent flow as it stubbornly ran mostly underground. Eventually we selected what seemed the best spot and filled our bottles hoping the seemingly clear water didn’t harbour anything nasty. By the time we reached the style on the Mourne Wall at the base of Bearnagh night was falling and Doan was fading slowly from view so we paused briefly to rummage for head torches and then sped on. The path from here was little more than a goat trail and we knew that if we dropped off then trying to find it again in the dark would probably be a pointless mission. Pausing, we could see Doan in the distance but knew that heading directly for it would need flippers and a snorkel rather than sturdy hiking boots as the terrain is notoriously boggy crossing the shores of one of the Blue Loughs and several rivers feeding Ben Crom Reservoir. 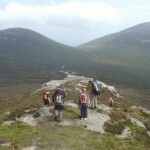 Instead we needed to stay on the trail that hugged the bottom of Meelmore, Meelbeg and Slieve Loughshannagh hitting Doan from the northeast where the terrain was a moonscape of heathery peat islands separated by marshy channels cut by years of flowing water. Initially the going was good but it didn’t take long before it was too dark to make out the path easily and we mistakenly began to drift down towards wetter and more boggy ground. Just after one of our party stepped into a deceptively deep bog and came out shoeless we decided to pause and get our bearings. 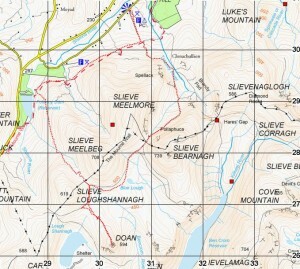 We were obviously off the path and could tell we had dropped too low by our proximity to the Blue Lough so we located the saddle between Meelbeg and Slieve Loughshannagh and headed directly for it up the grassy side of Meelbeg and as we neared the path reappeared. By this stage we could see a red light bobbing around in the distance and figured it was a member of our party that we were supposed to meet at the summit who had invariably become bored with our tardiness and come to see where the hell we were. As our white lights neared his we knew our short trek was nearly at and end and since it was after 11pm we would be glad to get our tents up and have a well earned rest. Crossing the boggy base of Doan proved easy as it was fairly dry and in no time we were on our way up towards the peak and the promise of some hot food. One frustrating false summit later we were at its granite top and a scary scramble up and over with a steep drop beneath was all that was required to end the hike and claim arrival. 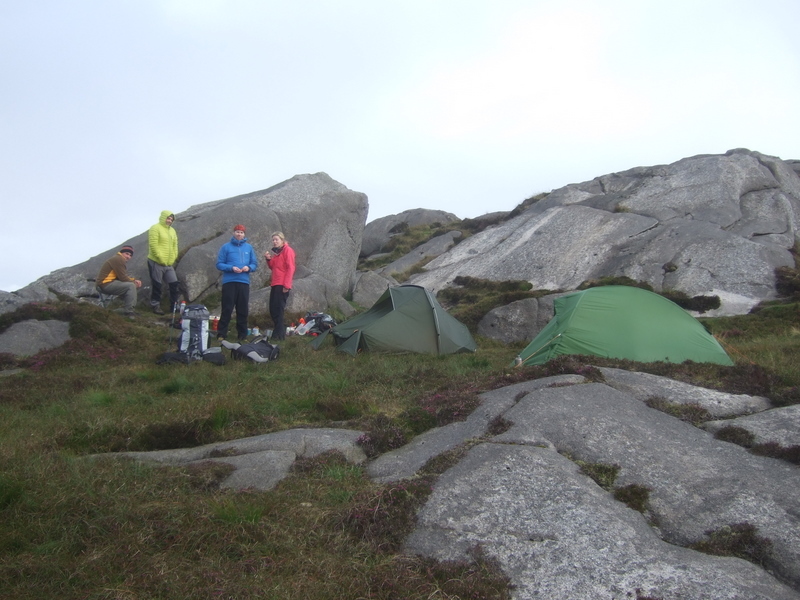 The summit of Doan looks like it will be rocky but once on top it has room enough for half a dozen tents on a lovely flat grass area surrounded by impressive granite tors. 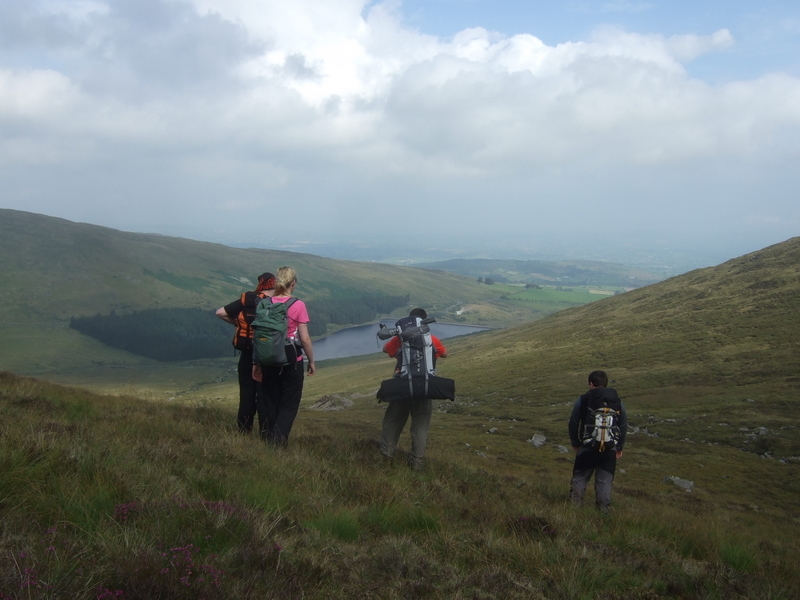 It also has simply stunning views on all sides with Meelmore, Meelbeg, Slieve Loughshannagh and Carn to the west, Slieve Bearnagh and Slieve Commedagh to the northeast, Slievelamagan and the other Blue Lough to the east and Slieve Binnian and the length of Silent Valley Reservoir to the south. Being very centrally located there is a real feeling of splendid isolation which is probably what draws us back to this pretty peak. No-one was bivvying tonight after a bad experience with midges the week before at Ben Crom so we all had to take ten minutes to get tents up and gear organised and once erected we could finally sit and relax. It was after midnight and we were peckish so stoves were unpacked and everyone had a quick bite to eat. Once fed we switched off the head torches and settled back to enjoy the moonless, cloudless sky. Doan is quite far from civilization and doesn’t suffer badly from light pollution so we had an awesome view of the stars with the Milky Way clearly visible as a white band across the sky. By 2am it was cool and we were all tired and retired to our sleeping bags. Up at 730am we kicked off with coffee and snacks while deciding which route to take back. 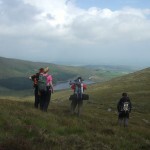 The lazier members of the group favoured returning the way we came, that being the quickest way to the sofa and Saturday afternoon sport but after a look at the map and brightening sky it was decided that returning the way you came was boring and we would head for the saddle between Slieve Loughshannagh and Slieve Meelbeg dropping down to Fofanny Reservoir to meet the Mourne Way back to Meelmore Lodge. The sun was starting to burn off the clouds and by the time we were packed and ready to go it was getting warm and turning into a great day for a hike. From Meelbeg to Fofanny there wasn’t much of a path and we soon had wet feet from the boggy ground but no-one seemed to care as the clouds had disappeared and we were bathed in glorious morning sunshine. The trek was uneventful and it wasn’t long before we were walking by Fofanny and our thoughts turned to bacon and egg rolls at the Meelmore Lodge cafe. 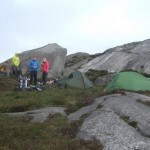 All in it was another great weekend and anyone that likes wildcamping should have Doan on their must-visit list. 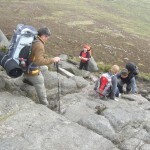 Finishing in the dark was a pain and we were suprised in places that the going was so damp considering the recent spell of great weather but I suppose you can never expect that the Mournes will ever be overly dry – it’s just a moist place.